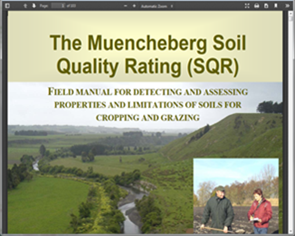 The Muencheberg Soil Quality Rating (M-SQR) is a simple and fast semi-quantitative method, which can be used by farmers and advisors. This field scoring method is used to analyse soil properties that limit crop yields and crop productivity potentials. Potential applications of the method are soil resource planning, guiding land purchase, and assessment of sustainability and environmental impacts of land use. Ratings of soil quality are made during common soil survey mainly by applying visual methods of soil quality. Only a minimum of equipment is required for the field assessment. A field manual provides rating tables based on response curves and thresholds for basic indicators and different hazard indicators (such as risk of drought). Finally, overall soil quality rating scores ranging from 0 (worst) to 100 (best) characterise crop yield potentials. The current approach is valid for grassland and cropland. The M-SQR matches with other dynamic soil quality assessments as VSA. This manual is not valid for some extremely particular soil and cropping conditions, as paddy rice systems and hazards as frost, fire and wind.